Understanding Embodiment: A Many Faced Coin. How cognition, emotion, body, and culture affect onto one another. It’s a constant question that’s been around as long as people have studied human behavior. There have been many iterations of this theory- from Albert Bandura’s theory of reciprocal determinism in the early 1960’s, to the field of Epigenetics in the present day. The current catch-all for this is the theory, expanded, of embodiment. It’s a simple concept with not-so-simple facets. Embodiment is the expression of how culture, mental processes, and the body affect onto one another. More simply put, that our behavior comes from more than jour brains alone. The idea, to us, seems like a no-brainer. The body and the fluctuations of mind exist in synchrony. The delicate rhythms of human response and perception have shaped our reactions in the past, and will continue to in the present and future. The conventional wisdom of Embodiment is something I’ve heard referred to as the “mind, body, spirit” connection. While not something wholly scientific, I think it’s a good way of saying that the body works with cognition and emotion in tandem, not in separate measure. It’s a lot to take in on a molecular level, and perhaps even more difficult to daisy-chain all the processes that allow emotion to circulate and surface. Untangling the web: What composes embodiment? Anthropologist Carol Worthman manages to cover many of these complex facets in her 1999 article on the subject. She says that emotion is an important survival tool, serving a myriad purposes. From mitigating trauma on a molecular level, to helping us navigate social interaction. She critically examines the often posed false dichotomy between emotion and “rational” or “instinctual” cognition. She proposes a dual model of embodiment, where local biology and cultural/biological ontogeny feed into each other. A good deal of the terminology in this article sent me running to some sort of Rosetta stone in a desperate plea for deciphering. I’m going to try to bluntly dissect them throughout this post. In layman’s terms, this is how biological factors weigh against individual development, and, on a more macro level, development within a culture. The second major cultural dichotomy to examine here is ethos versus eidos. Ethos is probably a term most are familiar with. It is, simply, a distinctive aspect of a certain culture, displayed in social beliefs and systems. It’s almost the spirit of a culture, shown through values. Eidos, on the other hand, is the rational paradigms and physical practices of a culture. It is how physical practices are implemented within it, such as diet and body modification. A familiar example to most of us- Native American tattoos to signal status or fertility. Image via http://www.enjoythemomentrituals.com/. If you’re like me, your original thought was probably to see these, at most, as vaguely interconnected on opposite ends of a similar spectrum. I honestly think this is a symptom of trying to believe that rational thought, act, or instinct is diametrically opposed to feeling and emotion. Ethos, the spirit of a people, seems far less concrete than the physical practices of a culture. On another project I’m working on, we talk about how people tend to see things as a dichotomy instead of a spectrum of continuum. The truth of the matter is much more tangled to grapple with- ethos and eidos may be dissimilar, but they shape behavior in equal measure. via Gai Foskett. 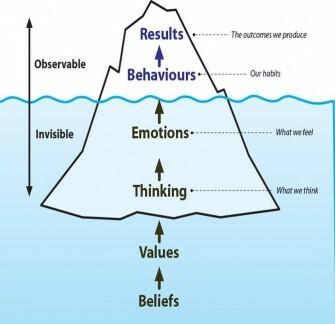 This is a simple model of what affects observable behavior on a subconscious level. Both models state that emotion is crucial in the process of both reaction and storage. It is a tool that allows us to cope, and fosters things such as creativity and self-value. And it works in tandem with instinct and cognition, not opposed to it. Problems with studying embodiment: Development, Ontogeny, and measurable value. Worthman states that a central problem with regards to embodiment is how adult-centered the field of anthropology tends to be. She postulates in order to study the holistic model, we must also examine the developmental stages of an individual- on both a macro and micro level. A large problem, in general, with embodiment, is we have no measurable way to quantify emotion, or weigh individualism against cultural value / expectation. She asserts culture can, however, influence the form and function of the body. I question this. Does is suggest the individuals self believed purpose or their culturally dictated purpose more affecting? This also, again, does not account for individualism. The keystone here, I think, is that culture can dictate -when- an individual experiences a certain thing, or at least increase the likelihood of it. Many cultures have ritualistic rites, concrete or abstract, that individuals go through after a certain life event, or to prove a certain social status. Example of the above: Satere-Mawe tribesmen of Brazil must withstand the sting of hundreds of bullet ants many times to be considered adults. Image via NoiseBreak. We’ve long since known that behavior, cognition, and environment tie into one another, each affecting an individual. Not so long ago, this was called reciprocal determinism, and before that, sociocognitive theory. One of the main takeaways from the former was that environment was critically undervalued in its effect on both other factors. Embodiment says this in so many words, with an emphasis on cultural and social environment. How similar or dissimilar are sociocognitive theory, reciprocal determinism, and embodiment? What is similar or different? How is eidos perceived in comparison to ethos? Is one more important? Emotion is undoubtably worth examining. Why is it hard to do so? How do we do so? How does cultural influence weigh in comparison to individualism on behavior? I enjoyed reading this article more than the Campbell article. 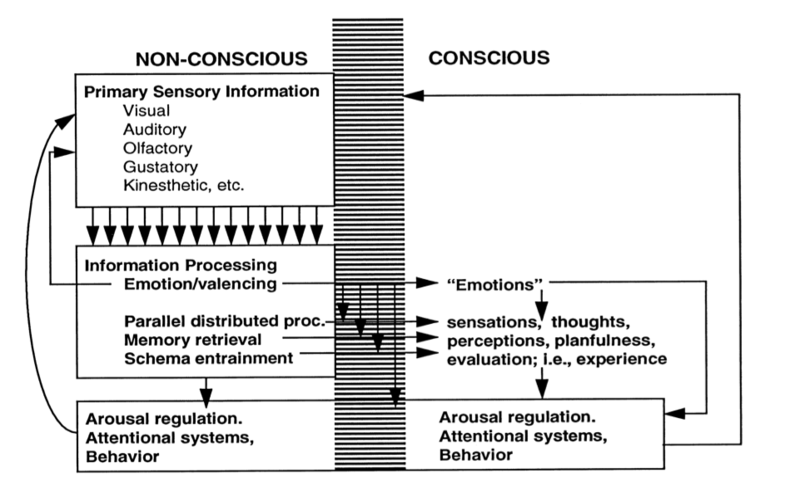 I found the connections between emotion and cognition to be more interesting personally. While I think Campbell’s work is interesting, I could see the results from Worthman’s work to be more beneficial across a larger population. Studying emotion forces the investigator to get to know their subjects on a deeper level and results in a fuller understanding of personality, behavior, and culture. The part of this article that stood out to me the most was the discussion of reactivity in childhood being relatively stable over time. I have always been very interested in the idea of sensory processing sensitivity and the highly sensitive person. There is often an emphasis in our society on “toughening up” and “not being so sensitive.” But, why do we privilege low-reactivity? How could we utilize the research on patterns of reactivity to adjust these cultural expectations to better account for individual variation? An interesting fact I heard on the radio today relates closely to our discussion yesterday and your questions about “toughening up” and “not being so sensitive”. I heard that studies show that women are nicer than men and that men are more selfish than women. Using this finding, which is a socialized way to behave, it makes me associate low-reactivity, niceness, and “sensitivity” with women and high-reactivity, selfishness and “toughening up” with men. This trend is also similar to my argument yesterday about how men are seen as more competent if they express anger/are argumentative/etc., which are expressions of emotion. However, when women show emotions associated with niceness, “sensitivity” and low-reactivity such as crying, they are viewed in a negative light. This was an interesting read. Emotions and rationality are often seen as a strong dichotomy. I appreciate the article pointing out how vital emotions are for our cognitive processes and that they are not separate things. Studying emotions does seem difficult. The idea that a developmental study needs to be done to fully understand emotions role and the impact on adults makes sense. This article was rather dense for me though with a lot of words that required me to look up. It took a while to break down the concepts in the article. I enjoyed the in class discussion on the difference in emotion and reactions based on gender. There is a difference in the way girls and boys are socialized, generally, to react to situations and process their emotions. It is important that we stop seeing rationality as a masculine trait and emotional expression as feminine. It is an unnecessary dichotomy that does not help anyone. After class last week, I was asked about this course and what we talked about during discussion and I was able to somewhat explain to someone what embodiment meant in my mind and provide reasonable confidence in what I was saying. The idea of embodiment is a super interesting topic and I feel like it’s a useful conversation to have. To answer your question about the similarity and dissimilarity of the three terms you mentioned, I think that there are quite a few similarities between them and very few, small, nuanced differences between them. I think that social cognitive theory is sort of a reflection of our knowledge that has been acquired from social interactions and experiences. Reciprocal determinism is also a theory but it is specifically about one’s behavior and how it can be a product of both personal factors and social, environmental, and cultural factors. I think embodiment can be partially defined as the tangible portrayal of that individual and sociocultural behavior. Your question of how does cultural influence weigh in comparison to individualism on behavior is actually something I think about quite a bit. Are we cultural dupes or are we unique and creative individuals? I think that it depends on your perspective and the debate I often refer to as, “How wide do you draw the circle?” Where do we draw the line when considering innovative action verses culturally patterned behavior? Do we consider people in India who wear a sari as unique because their outfit is worn only on certain occasions and it is a two-piece outfit that is always worn together? Or do we consider their outfit as not unique and different because it is still considered clothing and is used to cover the body and be worn in public? It really defines weather we want to group or divide. If we divide, then we would likely think that our behavior is individualistic and unique. If we group then we are likely to think that there is little human innovation and culture controls all individuals whether consciously or subconsciously. I think the question about why emotion is so hard to examine is interesting. I think it’s hard to measure because it’s so subjective. Emotions are difficult to define and there is a certain level of assumption when we talk about emotions. They are a self-reported feeling and everyone describes them in different ways. I think this sort of plays into Ekman’s research on identifying emotions by facial expressions. He basically outlined the “basic” human emotions by having people agree on what things like happy, sad, angry, ect. looked like. Lisa Feldman, the author of How emotions are made, said that “psychology is really experimental philosophy.” A big part of researching emotions is trying to take these common sense ideas and define them or categorize them scientifically. I think after reading the Decaro article the idea of “low-reactivity” in children makes a little more sense now, at least in terms of why we value it. These children who exhibit higher vagal tones and increased respiratory sinus arrhythmias demonstrate lower reactivity in a sense that they respond more appropriately to stressors. I think this article raises a better question about why this behavior is deemed preferable. I’m not sure I have the answer to that, but I think it points to a reoccurring trend about “fitting in” to society.